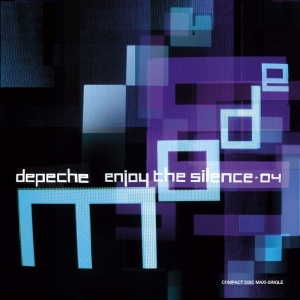 "Enjoy The Silence" is a song by the English electronic band Depeche Mode, taken from their seventh studio album, Violator. The song was recorded in 1989 and released on 16 January 1990 as the album's second single. It was re-released as a single in 2004 for the band's remix project Remixes 81–04. On the standard edition of the album (with 1 dot on the title), Mike Shinoda's remix is track 12, but on the Limited Edition (3-CD edition with 3 dots on the title) it is track 13 on disc 3. The remix isn't found on the 2-CD edition (with 2 dots) of the album. Singles were released for 3 remixes of "Enjoy The Silence", each of which can be differentiated by the number of dots on the title: Mike's remix has either 1 or none while "Timo Maas Extended Remix" has 2 or 3 and "Richard X Extended Mix" has 4. Promo releases are titled "Enjoy The Silence (Reinterpreted)" while singles are titled "Enjoy The Silence 04". Martin Gore explained how the song came together on issue 37 of Bong Magazine (the official Depeche Mode fan club magazine): "This was the only time ever in the studio when we thought we had a hit single. When I finished the demo of this song it was more of a ballad and sounded a bit like the harmonium version that came out on one of the formats. Alan had this idea to speed it up and make it a bit more disco which I was really averse to at first, because I thought ‘the song is called 'Enjoy The Silence' and it’s supposed to be about serenity, and serenity doesn’t go with the disco beat’. So I was sulking for about two days but after he sped it up, I got used to it and added the guitar part, which adds to the whole atmosphere. We could really hear that it had a crossover potential. I have to say that I was sulking for two days for no reason." As for the meaning of the song, he said, "It's just about a feeling of not wanting anything else, feeling totally satisfied, and even the words and everything seem an intrusion. You don't need anything else, you're totally happy. It's a nice song, it's nice, that's a way to put it, it's nice." On Depeche Mode's 2004 album Remixes 81-04, "Enjoy The Silence" was reimagined by Mike Shinoda as a distortion guitar-driven version of the song, in which he imprinted what, at the time, was Linkin Park's distinctive nu-metal sound. His bandmate Rob Bourdon contributed with drums to the remix. Linkin Park wrote about the impact Depeche Mode's music had on them: "We grew up on the band. They were one of our earliest influences--from the sounds they used to the ways they put a song together." An animated music video was directed by Uwe Flade. Monitors in the animation show performances of "Enjoy the Silence" excerpted from Devotional and One Night in Paris, as well as footage from a concert from The Singles Tour filmed in Cologne in 1998 for MTV. Features guitar, bass, piano and keyboards by Mike Shinoda and drums by Rob Bourdon. The CD dates from August 14, 2004. Released on LPLive for free download on August 6, 2018. Can't you understand / oh, my little girl? This page was last edited on 6 August 2018, at 11:37.